When picking a new hairstyle, looking at images is an important way to figure out what you think will look good, what you think won’t look good, and to get inspiration so that you don’t settle for that same worn out look you’ve been wearing for years. These dark brown hair images are perfect for women with darker colored hair looking for a way to shake things up. When looking through dark brown hair images, it’s important to know whether your looking for styling changes or cut changes. These images are coloring options that can help shake up both your style and cut. This image is a great example of using highlights and low lights in a natural caramel color to accentuate the eyes, in a style that helps bring the focus to the cheekbones, lending definition. She also has longer, side-swept bangs that bring the focus to her eyes and help to shorten the length of her face. Finding dark brown hair images that give newer coloring options can be difficult. This image shows a newer coloring style known as ombre coloring. You start the top of the head in one color and then gradually fade it into the other. You can easily see the difference in color here; the chestnut fades quickly into the auburn giving a bold, new look to the longer hair style. Long hair is perfect for ombre coloring as it has the length necessary to truly fade from one color to the other without looking like you dipped the ends of your hair into a pot of paint. Short hair shouldn’t be left out as an option for coloring either. Because shorter hair is naturally more striking, you can get away with a bolder coloring option such as the one seen here where auburn streaks are pulled through the hair as highlights. They catch the eye and give a beautiful resonance to the hair. Be sure your highlights match the base colors of your all-over hair dye. 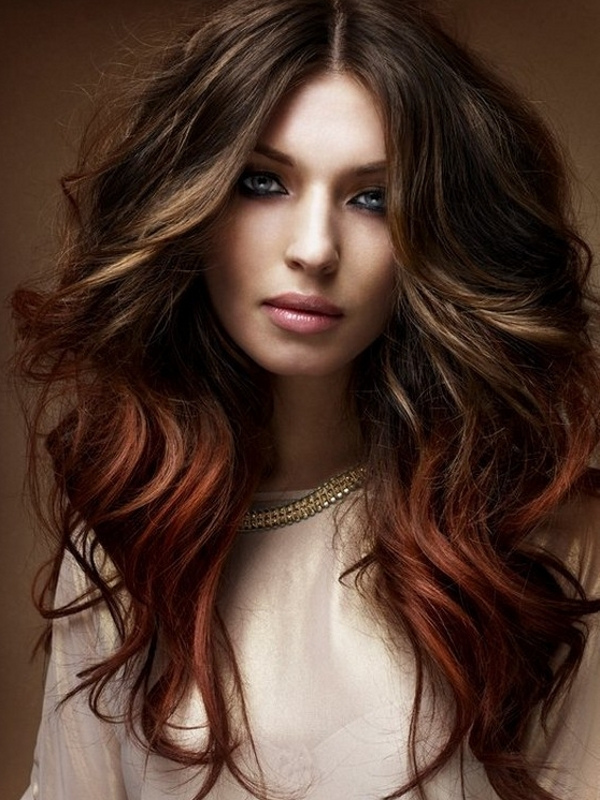 If your brown is a red-brown then your highlights will want to be red based so they don’t clash.